Located in the Ocean Grove section of prestigious Beacon's Reach,our 2000 sq. ft. beachfront townhouse is just 50 steps to the beach and 80 steps to the pool (yes we counted!). It sleeps 6 very comfortably with each of the three bedrooms on a separate level featuring it's own balcony and bathroom. The living room/dining room is on the top level. The well equipped kitchen has all stainless steel appliances and granite countertops. The bottom level has a beach room with Foosball table and two trundle beds which can sleep three more quests. Flat screen (HD) TVs in all rooms. Rental includes 8 beach chairs. Covered Parking, Located in the prestigious Beacon's Reach www.beaconsreach.com ocean to sound community with five tennis courts, walking trails and marina.If you have a boat, slips (subject to availability) can be rented in the marina for $25/day. Awesome in so many ways ! Janice and jack were the best so sweet! Thanks sharing your place with us! Our family had the most wonderful time, the location is incredible. 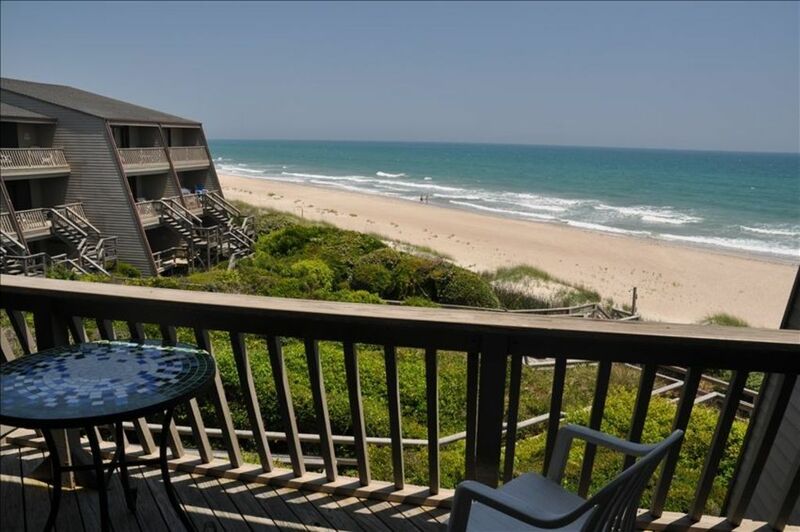 A beautifully landscaped boardwalk takes you steps to The beach or to the pool and right from your deck! The floor plan allows for plenty of privacy (having adult children) they're were 9 of us and still allow for plenty of family time! They provided many conveniences that others do not from beach chairs and toys, to linens. The Luttners made sure we had anything we could possibly need!! Can't wait to stay here again! Ocean Grove Unit G-5 was great! Ocean is just a few steps away! It was wonderful! Our family had a wonderful experience! Would recommend this place to anyone. The ocean is at your doorstep and there is also several pools to enjoy as well. Family friendly and the owners are great. Thank you! My family (parents, 2 kiddos (10 and 7), and grandma) spent a week in this wonderful condo. The location was perfect for us - non-crowded beach, great shells to hunt, waves to boogie board, and dolphins to watch in the morning! The property was well maintained with a great kitchen, multiple bathrooms, and spacious bedrooms. The on-site pools and tennis courts were fun to check out as well. We especially enjoyed visiting with other condo unit members/guests on the beach - it felt like we were part of a small community! The only drawback was for my mom (the grandma of our group) who had a bit of trouble with the stairs (six different levels in the condo) but that didn't bother the rest of our group. I would highly recommend this property. The owners were easy to work with and left a nice welcome note for us - very thoughtful! As long as you can handle stairs this place is amazing! Plenty of room for all 7 of us and it was decorated beautifully with plenty of items to make you feel right at home! My favorite pastime was sitting on the balcony off the bedroom reading. With the beach in your front yard and pools nearby...couldn’t ask for more! Great location and perfect accommodations for multiple couples with 3 bedrooms and baths on separate floors. Spacious living area and just a few steps to the beach. Overall a great vacation for our family. The townhouse is unit G-5 in the Ocean Grove section of the prestigeous Beacon's Reach ocean to sound community.